Today, and for the remainder of the cruise, the alarm was set for 6:30 so we could be on deck at sunrise. While getting our morning coffee we met Ingrid, a fascinating lady from Hanover, Germany. For the remainder of the cruise, we spent a good deal of time with her, especially early in the morning. Most passengers were not early risers. This surprised us as it is the most peaceful time of day on a sailing ship. And the early light makes the sky and the sea extremely striking. Each day, there were only six of us out on deck at sunrise: Al, me, Ingrid, Sheila, a lady from Amsterdam, and the woman in the striped shirt who was always exercising. Also, at this early hour, we could talk to the first officer on the bridge. Dariuz Zarwalski, from Poland, was more than willing to answer all our questions about the ship, sailing in general, our ports, our crew, everything. Topics weren't just related to sailing; by the end of our two weeks on board, our conversations ranged as far as the future of real estate in Poland. Dariuz was the best example of how nice the crew was to passengers. The sea was wonderful this Monday, with swells causing the ship to rise and fall as it sailed south. Unfortunately, the swells also prohibited us from reaching our intended destination. The schedule called for us to anchor off Agropoli, take the tender into the harbor and then a bus to Paestum, a few kilometers away. But the sea was too rough to safely transfer passengers into the tenders. 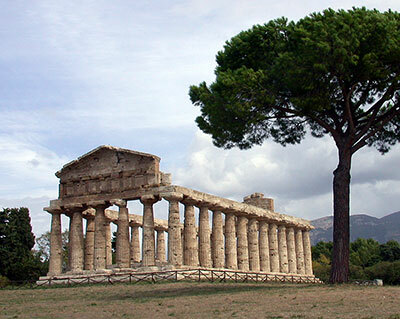 So the captain changed course for Solerno, about 30 kilometers north of Paestum. After a couple more hours, we docked at Solerno and hopped on a bus for our tour. On arrival, we were given 45 minutes for lunch. 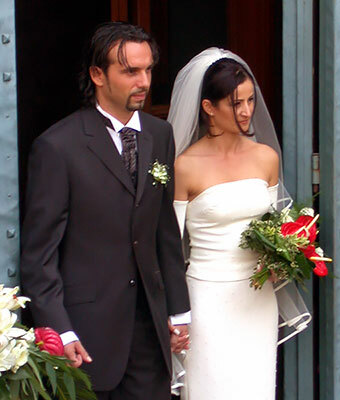 Al poked about the small town, came upon a wedding at the local church, and unobtrusively photographed the happy newlyweds and their friends. Meanwhile, I found the Herald Tribune, our first news since boarding the ship. 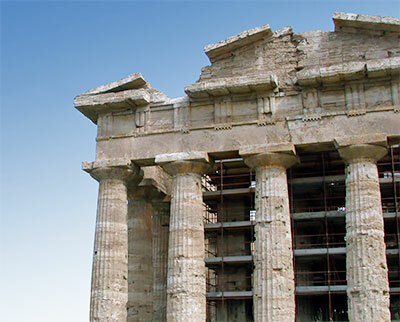 Paestum was a Greek colony founded about 600 BC, originally called Poseidonia. It was conquered by a local tribe two hundred years later and eventually fell under the rule of Rome. Malaria hit the area hard near the end of the Empire and the town was deserted by its inhabitants. The site was rediscovered quite by accident in 1750 when a road was being built. Archeological work has been going on for 250 years but much of the old city is still covered. We had a wonderful guide, Professor Giovanni Schiavone. His enthusiasm for the site was infectious and made his presentation all the more interesting. He could, and would, have talked much longer than the allotted two hours. 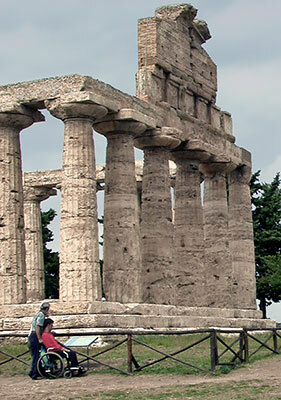 There are three intact temples from the Greek era, each a little different in style. The town center was the forum, surrounded by a portico and shops. Also in evidence were remnants of the covered market, amphitheater, gymnasium, underground temple, and many other public and private buildings. The professor said that much more of the site had never been excavated because it was on private land and the state didn't have the money to buy it. The archeological museum was closed today but that wasn't a problem for us as it gave us more time with the professor. Our bus had us back at the ship for a 4:30 sailing, accompanied as always by the 1492 theme music. At dinner that night we met a friendly foursome from Kingswood, Surrey, England. They, too, were taking back-to-back cruises and we would get to know them over the course of the two weeks. Stan and Pauline, and Ken and Sheila, have known each other for many years and had taken cruises together in the past. "The Surreys", as we referred to them until we could remember their names, were charming traveling companions. Our paths crossed many times on various shore excursions and they were always a delight to be with and talk to.